The Grain Millers Association of Zimbabwe has joined hands in the fight against cholera after donating 200 000 litres of treated water at Glen View Poly Clinic yesterday. The water is for consumption by residents of Glen View and Budiriro where it is the cholera epicentre. As of Monday, cholera had claimed 31 lives with fears of it spreading across the country. Speaking at the handover ceremony, GMAZ general manager Linnet Vheremu said they put people’s health first. “We have put into consideration how many families have lost their loved ones and we have set it our goal to help by giving them clean and safe water. “As Grain Millers, the health of the people is our concern because they are our customer. Without them there is no business. “This is part of our social corporate responsibility initiative as we try to grow communities,” she said. 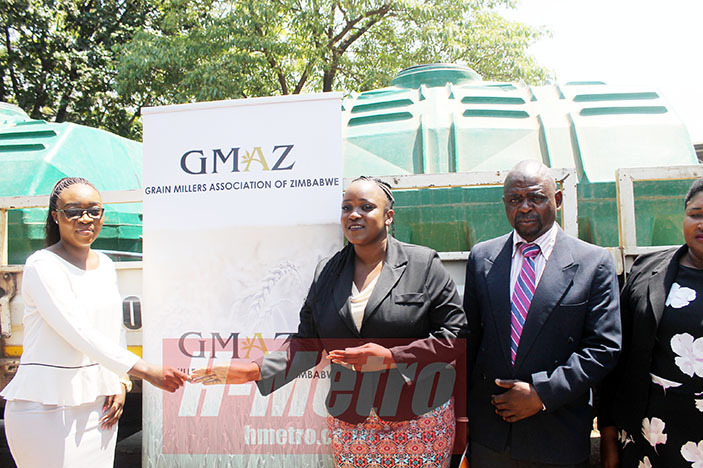 Councillor Kudzai Kadzombe who was representing the Harare Mayor Herbert Gomba expressed gratitude to GMAZ for their efforts in combating cholera. “We are so grateful to the association for thinking about us as residence and we are working flat out to educate our residents about cholera. “We are trying everything in our power to make sure that we provide safe clean water to the residents and we are noting down all the damaged sewer systems and we will soon make moves to restore it. “The donation towards people to fight cholera must not end in Glen View, they must also extend their hand to every affected place,” said Kadzombe.